You probably would love to hit the ball farther on the golf course, but you are in a quandary about how to go about it. 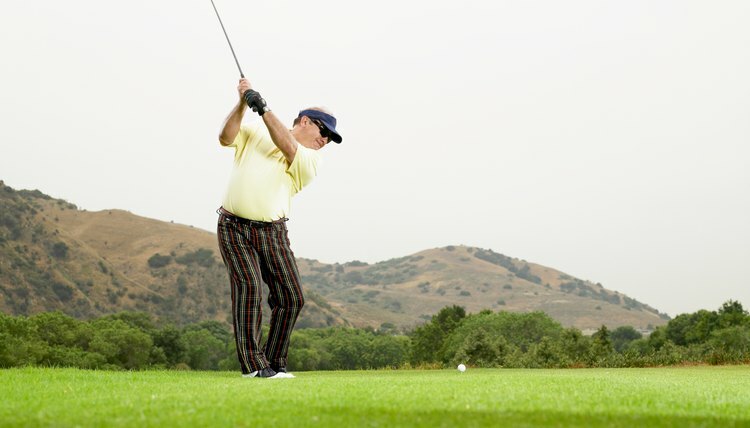 You've tried lengthening your swing, but that doesn't help much. And even when you try to hit the ball harder, you seem to hit it the same distance or perhaps even shorter. There are lots of things you can do to hit the ball a greater distance, but there is one proven way that takes a bit of work, but will result in added length and confidence. Overcome the notion that your hands must do all the work when you swing the club. Instead, you should begin to use more of your body, which will result in greater distance. By using only your arms and hands, in effect you are “pushing” the golf ball forward, but when you use more of your body, there will be more chance for you to “pull” the golf club through the hitting area. This action is known as creating lag in your golf swing. Eliminate the use of the thumb and forefinger on your bottom hand when you practice a swing with more lag. To do this, remove both from the shaft of your club, with your thumb aiming straight up and your forefinger off the shaft and pointing towards the clubhead. The reason for doing this is simple: In almost everything we do manually, our thumbs and forefingers do most of the work. By eliminating their use in the golf swing, you will be forced to use more of your body when you swing the club and will create so-called “lag" in the process. And lag will create more distance. Return your fingers to their normal position on the golf course after you have learned how to improve your swing by increasing its lag. Face it, you'll look silly swinging with your two fingers off the grip; however, try your best to relax these two fingers as you take the club back, then through the hitting area. With practice, you will hit the golf ball using more of your legs and torso, and eventually you will hit the golf ball farther. What Must Happen in a Golf Swing?